Leprosy From An Armadillo? That's An Unlikely Peccadillo : Shots - Health News Yes, health officials in Florida have reported nine cases of leprosy so far this year. And yes, armadillos can transmit leprosy. But scientists say we needn't fear the armored mammals. Public health threat, or just a very odd animal you're likely to see in the southern United States? Armadillos. Leprosy. Florida. It's hard to ignore news reports that fit all three words in the first sentence. So when we heard that state health officials in Florida have reported nine people with leprosy and suggested that people avoid armadillos, we here at Team Shots just had to check it out. Apparently all of the people who fell ill say they'd interacted with armadillos. That's not completely crazy; there are armadillos aplenty in the southern United States, and Florida averages about 10 cases of leprosy a year. What's more, the hard-shelled mammals are the only other creature aside from humans that can be infected outside the laboratory with Mycobacterium leprae, aka Hansen's disease. The disease was feared for centuries for cruelly disfiguring its victims, but can now be treated with antibiotics if it's properly diagnosed. Here's what's got me confused. The slow-moving bacterium can incubate in people for three to seven years before they get sick. How then could the Florida cases be definitively linked to consorting with armored wildlife? To find out, I called up Dr. Richard Truman, acting chief of the laboratory research branch of the National Hansen's Disease Program in Baton Rouge, La. He's authored 31 articles on armadillos and leprosy, using them as an animal model to study the disease. That includes a 2011 article in the New England Journal of Medicine showing that armadillos almost certainly infect people with leprosy, based on the genetic similarity of bacteria taken from armadillos and humans in the southern United States. Until then, it was thought leprosy could spread only among humans, most likely through sneezes. Knowing there's an animal reservoir helps explain why people continue to fall ill, even though the disease is rare in the U.S.
OK, back to Florida. When I asked Truman about the odds that those nine could all be armadillo-acquired, he quickly pointed out that he knew nothing about the specifics of those cases. But it's pretty clear that he's not fussed. "For one, what kind of numbers are we talking about? That's not very different than what may be occurring over normal periods of time," Truman says. What's more, genetics plays an incredibly strong role in susceptibility to the disease, he says, with 95 percent of humans completely immune. That doesn't mean you should canoodle with an armadillo, he notes. But with just 150 to 200 new cases a year in the U.S., and most of those coming from people who were overseas in countries with much higher leprosy rates, even people who live in armadillo-rich environs needn't fret. 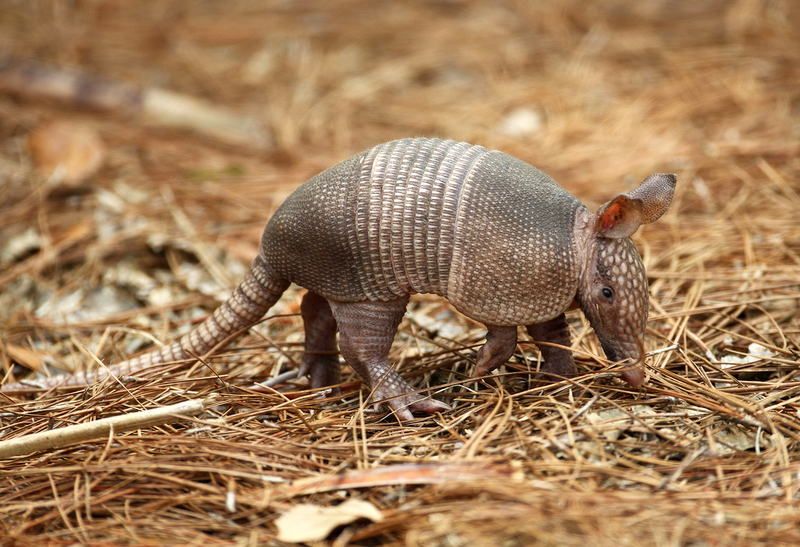 "Between Texas and Louisiana and the southern United States, many millions of people have direct or indirect exposure to armadillos every day," Truman says. And they don't get infected. He's been working in the lab with armadillos for decades. Has he become fond of them? Truman just laughs. It's pretty clear that here is a man who doesn't get too worked up over armadillos. And he thinks we shouldn't, either. "All wild animals can harbor infectious agents that are harmful to people," Truman says. "If we leave animals alone and exercise caution, they don't pose a risk to us."